Description: This three mile stretch of the 20-foot wide Michigan River is characterized by curving cutbanks, with some riffles and fast water. It has not been fished much over the past 20 years and contains many mid-sized browns and rainbows, averaging 13 inches. 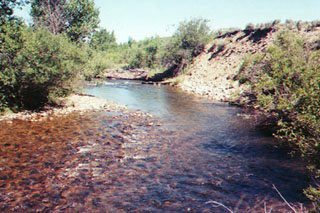 Location: This property is located close to Gould, approximately 2 1/2 hours northwest of Denver.